Welcome to CRM in the era of mobility. This evolution stands finally to extend the value of CRM from the management suite down to the field salespeople to whom it was previously an annoyance. Instead of setting out to create an application that would be useful to sales managers, the new breed of mobile CRM designers decided to create something that individual sales contributors out on the road would want and need to use. 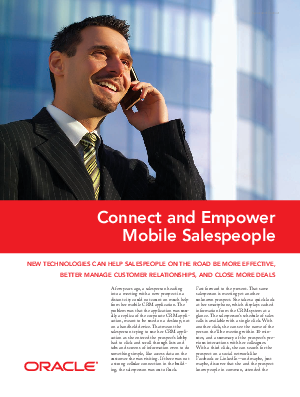 Read this white paper to learn how a lightweight mobile CRM application - more task - than system-focused - can actually provide useful information and encourage salespeople to utilize it.